The Texas Star Party was started in 1979 by Deborah Byrd, members of the Austin Astronomical Society, and the University of Texas McDonald Observatory. It was a gathering of 50-100 astronomy enthusiasts for a weekend in August at nearby Davis Mountains State Park. There was observing, comraderie, a Saturday evening speaker, and special Saturday night observing at McDonald Observatory. Founders David Clark, George Ellis, and Don Garland organized the TSP on Prude Ranch in 1982. The TSP is held each year in late April or May. Astronomy clubs from the Southwest Region of the Astronomical League(SWRAL) and individual volunteers help operate the annual astronomy convention. TSP annual population has grown from 535 attendees in 1982 to more than 800 attendees in 1994. The TSP relationship with McDonald Observatory and the University of Texas has remained strong throughout the years. TSP has strongly supported the protection of night-time skies from ever-growing light-pollution. This support has included funding public information vehicles regarding light pollution, efficient lighting practices, and exterior-lighting ordinances in the west Texas area. TSP Light Reduction Project donors raised over $25,000 for activities such as the replacement of various street light fixtures throughout Jeff Davis county and in nearby towns of Fort Davis, Valentine, Marfa, and Alpine. This continuing effort is intended to preserve the dark skies for future TSPs, as well as to protect the viability of McDonald Observatory. 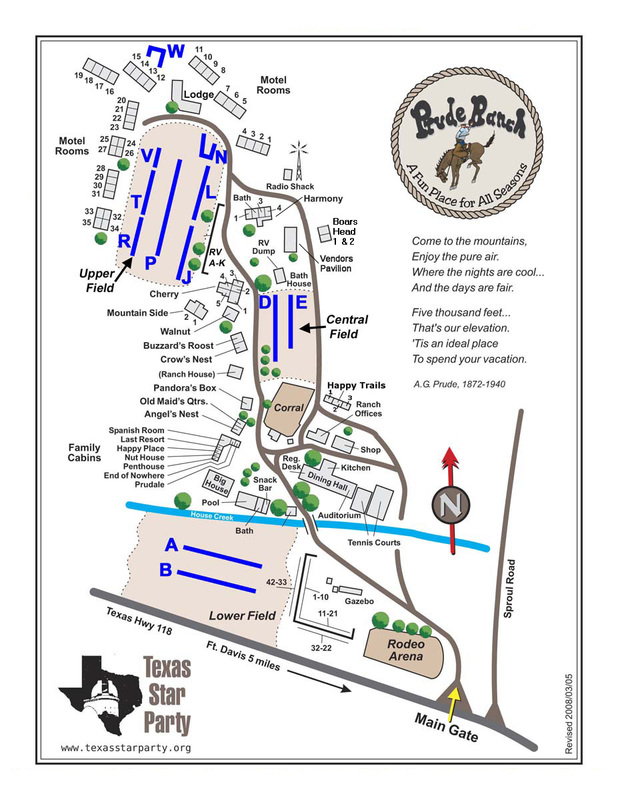 TSP 1997 was held at Alto Frio Baptist Encampment, on the banks of the Frio River, 40 miles north of Uvalde, Texas. 677 people attended. In 1998, TSP returned to the Prude Ranch. The Texas Star Party is now operated by Texas Star Party, Inc. a non-profit corporation. Make a suggestion to us for a future recipient of this dedicated observer award. Make a suggestion to us for a future recipient of this dedicated service-towards-astronomy award. At TSP 1996, Brian Skiff (see above) named one of the asteroids that he had previously discovered. Texstapa (4932) is 1984 EA1, discovered on March 9, 1984 by Brian at the Anderson Mesa Station of the Lowell Observatory. Named for the Texas Star Party on the occasion of its 18th anniversary in May 1996. Founded in 1979 by Deborah Byrd, the event has since become one of the largest meetings of amateur astronomers in North America. It provides amateur astronomers with the opportunity for visual observing, imaging, and fellowship under clear, dark Texas skies.